A composite page, once formed, may be assigned a subtype - an alphanumneric label up to 256 characters in length. 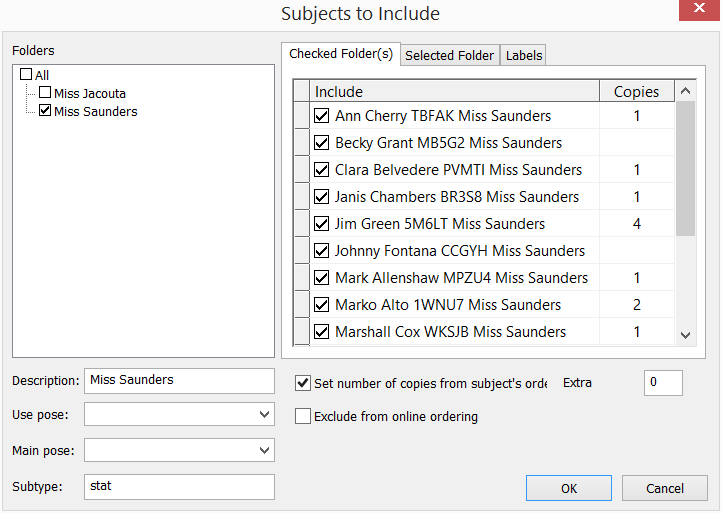 Although up to 256 characters is allowed, it is recommended the subtype labels be kept small especially if they are to be ordered by barcodes. Once a composite page has been labeled with a subtype it can be ordered in two ways. By creating a composite product in tsAdministrator with a matching subtype and adding this product to a package in the normal way. By scanning barcodes suitably encoded to order the subtype. A composite page is labeled with a subtype in the 'Subjects to include' window of the Form Pages Mode of NeoComposite and CompositeBuilder. The screen grab above is an example of where the photographer wishes to offer both rotated and static composites and to this end has labeled the static pages with 'stat'. The rotated pages could be labeled with 'rot' for example. It is important to realise once a composite page has been labeled with a subtype, special handling is then required to order the page. It must be ordered via a product with matching subtype or with a suitably encoded barcode. Prior to the introduction of subtypes it was only ever necessary to have a single composite product in tsAdminsitrator and this product was added to any packages requiring a composite page. If the subject was in multiple composite pages, no distinction could be made between them. With Version 4.4 and subtypes it is possible to add multiple composite products each with their own subtype. The key principle is the product subtype in tsAdministrator 'matches' the composite page subtype in NeoComposite or CompositeBuilder. The different composite products may then be added to packages to order the desired composite page. The screen grab above shows an excerpt of the products object in tsAdminsitrator. Note three different composite products. The first product does not have a subtype while the next two are labeled with a subtype of 'rot' and 'stat' respectively and will be used to order rotated and static composites. Once the different products have been defined in tsAdminsitrator they can be added to a package in an offer in the usual way. 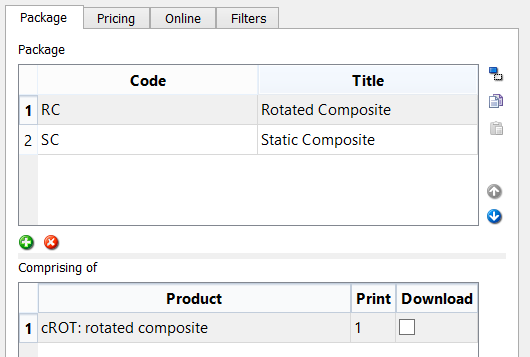 The screen grab below shows an offer with two packages - one is ordering the rotated composite product, the other the static composite product. The method above requires additional products to be added to tsAdminsitrator that match the subtype label given to composite pages in NeoComposite or CompositeBuilder. An alternate method is to continue with a single composite product in tsAdministrator but then use barcodes to order the appropriate composite subtypes. 'Sticky' or 'non-sticky' barcodes can be scanned with a package barcode to order the appropriate composite subtype.